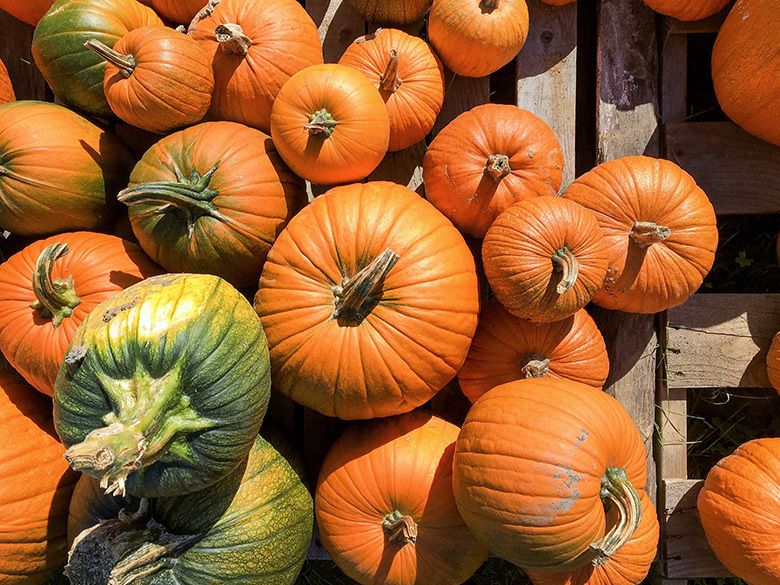 If you’re a pumpkin lover, then today is your special day. Because it’s the second annual Virtual Pumpkin Party hosted by Sara from Cake Over Steak. Which means that dozens and dozens of brand spanking new savory and sweet pumpkin recipes from some of your favorite food bloggers will be hitting the internet. It’s kind of epic. Me? I’ve never really been bitten by the pumpkin bug. In fact, I’m sometimes even audibly opposed to the whole idea. Part of this is for social/cultural reasons. I just can’t stand the pumpkin mania that descends upon us every August. It’s too soon. August is for eating watermelon until your hands and face are sticky. And for enjoying fruity cocktails in the sun until you feel that warm glow both inside and out. August is not meant for pumpkin. So I find myself shunning pumpkin, maybe more harshly than it deserves. Because in my own weird way, it’s how I rebel against the early adopters. Also, I’ve come to realize that I’m just not a super huge fan of either the canned stuff or the overpowering flavor that can come from pre-made pumpkin spice mixes. Sure, I’ve used them in the past with success. And I probably will again in the future. There is no denying their convenience. But maybe going forward, they won’t be my main source for pumpkin inspiration. So to try to learn to love pumpkin (or at least to not so fiercely oppose it), I’m setting my focus on the fresh stuff. Real pumpkins. Grown locally and harvested in season. And you know what? I may be turning over a new leaf. For last years #virtualpumpkinparty, I crafted this festive Pumpkin Beertail with Tequila and Spiced Rum (have you seen the color of this baby?). So this year, I decided to go the savory route. 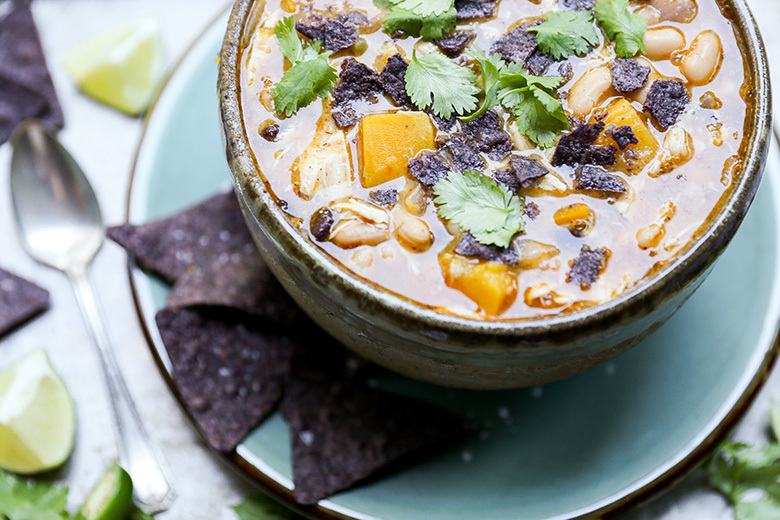 I picked up some fresh pumpkins from the local farm stand (the ones for cooking will be labeled “sugar pumpkins” or “pie pumpkins”) and got to work at creating this easy Chicken and Pumpkin Chili. 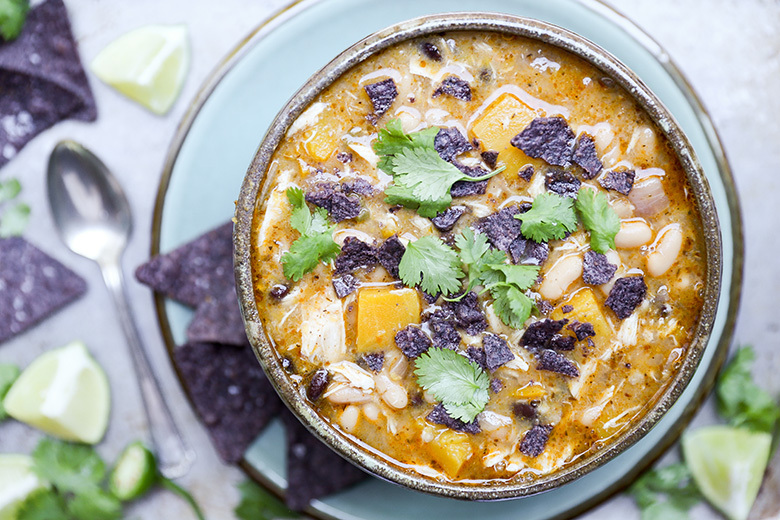 It’s super hearty, filled with big chunks of pumpkin, shredded chicken and both white and black beans. And it’s loaded with warming spices like ginger and cumin. Oh and don’t skip the corn tortilla chips for serving. They are absolutely necessary, in my humble opinion. To make my life easier, I used shredded chicken that I removed from one of those grocery store rotisserie chickens. It’s one of my favorite kitchen shortcuts, and I have no shame in admitting that. But you can cook your own chicken at home and use that instead, if you prefer. Dismantling a whole pumpkin can be a bit intimidating. And I’m certainly no expert at this task. I cut mine into wedges, scooped out and discarded the seeds. Then removed the skin with a standard vegetable peeler before dicing the flesh into cubes. If you have a better way of handling things, please let me know! Oh and if you’re opposed to pumpkin (or simply can’t find any fresh ones), you can substitute in an equal amount of peeled and cubed butternut squash or sweet potato. To check out all the other bloggers pumpkin recipes, visit Sara’s blog HERE for the full list. And here is last years list, if you need even more inspiration! Warm the olive oil in a large heavy-bottom pot over medium-high heat. Add the red onion and cook, stirring frequently, until slightly softened, about 3 minutes. Add the minced garlic and diced jalapeño pepper and cook, stirring frequently, until fragrant, about 1-2 minutes. Add the cubed pumpkin and all the spices, stirring to coat the vegetables in the spices. Stir in the chicken broth and beans. Cover the pot and bring the chili to a boil. Then turn down the heat to maintain a simmer. Cook the chili, covered, for about 15-20 minutes, or until the pumpkin is tender. Stir in the shredded chicken, agave and lime juice and cook until the chicken is warmed through. To serve, ladle the chili into bowls. Top with crushed tortilla chips and fresh cilantro, if desired. Looks and sound delicious Liz! I myself love pumpkin, so I can eat enough for the two of us! Can’t wait to check out all the pumpkin recipes! Thanks for sharing! Thanks, Kelsey! Loving all the gorgeous recipes today! Oh yeah, chickpeas would be great! I am a pumpkin lover, but I agree that August is just too soon. I too am up to my elbows in watermelon in the late summer. But once October hits, I am ready. 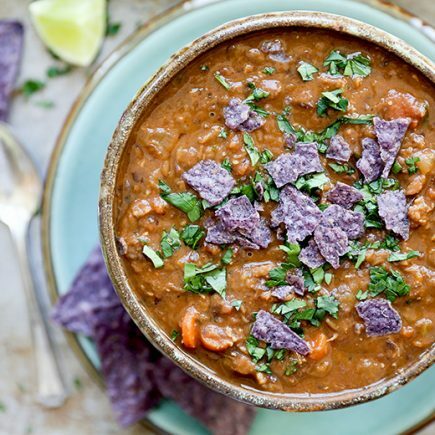 And this chili is just perfect for our chilly days. Yum! This bowl of chili will definitely warm you up on a cold October day! All I want in life is this pumpkin chili!! Gorgeous, friend! Hi Liz, I really appreciate about your hobby. Your pumpkin chili recipe looks very yummy. I want to try it certainly. Thanks for sharing. 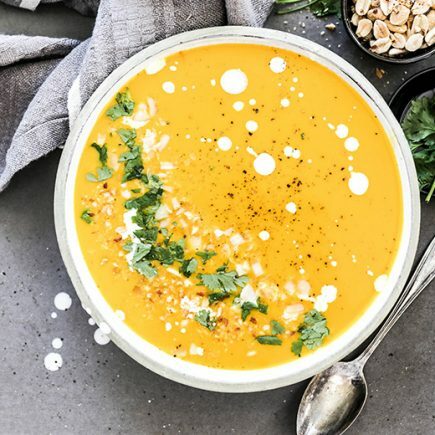 I’m not a fan of spiced/too sweet pumpkin or squash soups, so this would be my ideal fall soup! Hooray! I hope you try it out! This sounds very good, though I would sub the pumpkin for butternut squash – or purple sweet potatoes. I’ve never been a big fan of pumpkin, though I try to eat it. But my husband doesn’t like it at all. Fortunately we do like both butternut squash and sweet potatoes. This recipe works great with butternut or sweet potatoes!